Torquay United manager Kevin Nicholson says his decision to keep injured right-back Durrell Berry at the club is not an act of 'charity'. 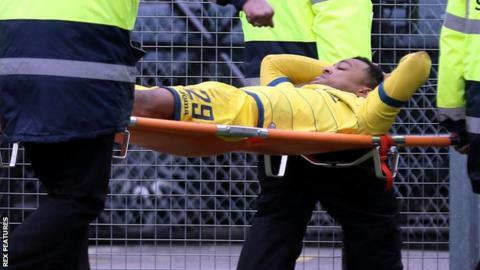 The 23-year-old broke his leg at Dover in March and is not expected to be fit until well into next season. "It's not sympathy, it's not charity, it's done because I know what a good player he is," Nicholson said. "When he gets back fit and back on that pitch i think everybody will realise I've made a good decision." Berry, who began his career at Aston Villa before spending three-and-a-half years with Plymouth Argyle, joined Torquay for a second time in September, shortly after former manager Paul Cox left the club. "Durrell Berry's an excellent player and he was playing very very well before his unfortunate injury," Nicholson told BBC Sport. "I know that if Durrell Berry played to the level that he was playing for a full season, we'd probably get money for him."